It's that time of year to show off your fur babies. I wasn't going to join in but then I thought why not? It's so fun to see all those adorable pets. 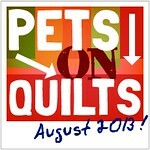 The quilt show ends on Aug. 17th so break out your cameras and join in. This is our cat Duchess. She's the youngest kitty. Our son begged us to keep her when one of his classmates was giving her kittens away many years ago. Even though Duchess is older now, she still acts like a kitten and sometimes we wonder if she's meant to be a cat because she loves to play fetch. Duchess and our other cats love quilts. There's just something about a handmade quilt that draws them to it. We always have one or two quilts laying around in our family room. This quilt was one I made quite a few years back. I can't remember how long but a long time ago. Back then I usually head to the Thimbleberries fabrics or 30's reproduction prints. I still love 30's prints. The Thimbleberries fabrics I don't use much but I still love them. This quilt is a variation of the traditional log cabin block. It's perfect for the couch to snuggle under on cool crisp nights. I hope you'll hop on over to the quilt show and check out all the adorable pets. On another note, I am still accepting participants for the Pretty Pouch Swap. This is going to be so much fun! Hope you can participate. You can see the guidelines here. She is absolutely beautiful and the name so suits her. I love this quilt! Something about it calls up the feeling of an afghan - super cuddly and inviting. Pretty Dutchess, too. We've had two cats who loved playing fetch - one went bonkers to have the ring that pops off milk caps tossed for him, and the other just *loved* fetching hair ties. Go figure! Isn't it a crack-up? Your cat definitely looks like a Duchess, maybe even a queen. :-) I've had a cat who would play fetch, with cellophane wrapped butterscotch candies; he wouldn't play with mint flavored ones. He was yellow tabby and named Garfunkel; his brother was black and white and named Simon. Guess which decade, LOL. Duchess is beautiful, and I love your quilt. Duchess is quite sweet and looks rather comfortable on your lovely quilt. Duchess and the quilt are beautiful. Helloooo ~ Let me introduce myself, I am Sweet William The Scot, and I am taking the tour of the quilts. I am more of a dog blogger, but I have made three quilts in my lifetime. I love the reproduction prints and apparently Duchess does also. Duchess is a lovely name - really suits her. she looks like she owns that quilt! Duchess is lovely and your quilt is too!! Duchess is a beauty. And your Memory lane quilt is awesome! Can't wait to see it all finished! Duchess is lovely and so is your quilt. What a sweety. My cat that look similar to your also fetches and retrieves. Currently her favorite is rabbits feet. A very regal looking cat. Gorgeous photo of a beautiful cat! Thank you for joining the party! She is so pretty and so is the quilt! What a great quilt! Duchess is posing perfect for the picture! Lucky kitty! She is adorable and looks lovely with the quilt. Thanks for sharing!